M. Night Shyamalan's Glass held strong for the third week in a row scoring $9.5M to win a very quiet Super Bowl weekend. That gives the anticipated film $88.6M domestic and $198M worldwide. It's still got a ways to go to top Split's $278M haul and Unbreakable's $248M, but it has a good shot at beating both. 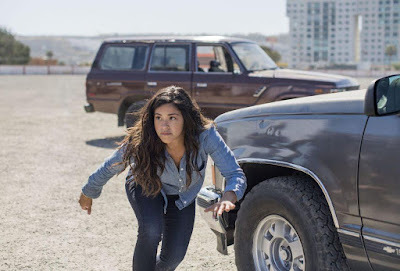 That Miss Bala didn't perform well this week, only earning $6.7M, isn't shocking considering this weekend historically has always been a box office bummer unless you're Liam Neeson starring in Taken. The action-thriller and remake to the excellent 2011 Mexican film stars Gina Rodriguez as a woman who gets caught in the middle of a war between a drug cartel and the DEA. Rodriguez is a great actress and having seen it last night, I felt she really made the most of this rare opportunity for a Mexican woman to lead this sort of film stateside. But the reviews were generally pretty bad, there was no heat behind it, and so the disappointing results aren't a surprise. Oof. Joe Cornish's big comeback film, the well-received adventure The Kid Who Would Be King, had a solid hold in earning $4.2M, but it's not enough to save this $60M dud. Peter Jackson's acclaimed WWI documentary They Shall Not Grow Old has technically been out for seven weeks playing at a variety of special event screenings where it earned over $8M. It breaks into the top 10 in its first week of formal release in 735 theatres, earning an excellent $2.4M.